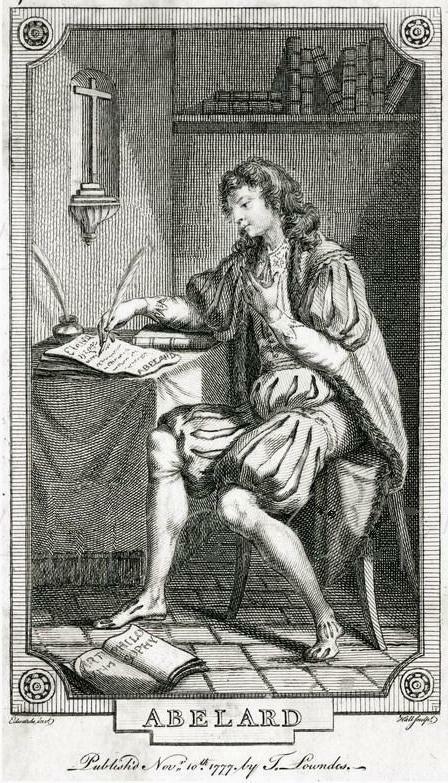 In his exquisite 1717 elegy, Eloisa to Abelard, Neoclassical poet Alexander Pope pays tribute a tragic love story from the Middle Ages as he laments the excruciating pain of desire and memory. Alexander Pope probably dreaming up some of these romantic verses. Here Pope writes as a real 12th-century Parisian woman named Eloisa. Hailed as a brilliant linguist and logician, she was one of the most educated women of her time. She soon engages in a torrid affair with her teacher, the celebrated theologian Pierre Abelard. Eloisa and Abelard sneakin’ a little smooch. Furious about this romance, as well as the couple’s secret wedding and pregnancy, Eloisa’s uncle, a high-ranking church official, hired a band of thugs to attack Abelard. He then retreated to monastic life as Eloisa took the veil. Although the couple never saw each other again, they wrote passionate love letters to each other for decades following their initial liaison. Abelard wooing his lady. Also, what is up with his feet? Pope’s poem imagines itself as one of the final letters Eloisa sends to Abelard after he implores her to renounce her passion for him and instead focus on God. Heartbroken, Eloisa scolds the philosopher-turned-monk for his cowardice in abandoning her. Come, Abelard! for what hast thou to dread? The torch of Venus burns not for the dead. Ev'n thou art cold—yet Eloisa loves. To light the dead, and warm th' unfruitful urn. She argues that the dead are not granted the opportunity to love, they must do so now, while they both still live and breathe. Eloisa curses the flames that still burn, likening them to hellfire - torturous and everlasting. They rage on without even the slightest spark of hope. Let me know what you think of this poem. Have you read it? Did you enjoy it? In your opinion, is this an accurate or interesting depiction of romantic desire? Thanks so much! Bye for now!